Reflected below is the template used to file Police Brutality & Corruption Complaints Against the Woefully Corrupt Orange County (North Carolina) Sheriff (Lindy Pendergrass), Major Charles Blackwood and other deputies who have abused their authority (e.g., JC Clayton), along with collaborating public officials (e.g., Court Clerk James Stanford and Magistrate Gregory Stephens). These folks believe that they are above the law -- FALSE. 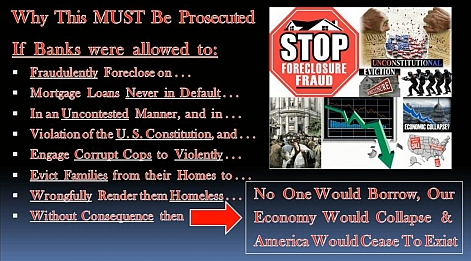 In fact, they are bullying menaces to society and they MUST be removed and fully prosecuted for their criminal roles in The Worst Bank Foreclosure Fraud in US History. Re: Police Brutality & Corruption – Orange County (NC) Sheriff’s Dept. Thank you for speaking with me today by phone. You will note this complaint is deliberately unconventional and attention-getting, in response to extensive cover-up efforts. Moreover, it is being shared with numerous news media outlets due to its seriousness, scope and magnitude. It is presented in three formats: (1) video; (2) presentation slides; and (3) written narrative. In closing, my quest for justice is summarized in a two-minute video, which I’ve delivered in five languages to underscore its importance: http://www.morganstanleygate.com/2012/03/countdown-to-justice-begins-in-two.html. And as I mentioned in our phone conversation today, by merely initiating the investigations in this instance of police brutality and corruption, the many elements of this scandal will thus unravel and countless others will benefit from the revelations that will then unfold. Moreover, I reproduced (below) one of the slides which aptly summarizes why I believe this MUST be prosecuted.